The Ryan Gosling film is no ordinary rocket ship movie. Ryan Gosling aims for the moon. The first thing we notice about Damien Chazelle’s First Man is the age of the technology. When astronaut-to-be Neil Armstrong (played by Ryan Gosling) runs into trouble flying his experimental X-15 hypersonic rocket-powered plane at an altitude of more than 100,000 feet, the dials on the aircraft don’t look sufficient to help operate an ordinary car today. Later, when Armstrong and his two crew members are loaded into the Apollo 11 for the very first human voyage to the surface of the moon, their equipment seems quaint and almost homemade compared to 21st-century digital fittings. The rocket creaks and the cockpit looks like someone had partied in it the night before. Even their flight suits look shabby and worn. That impresses us. 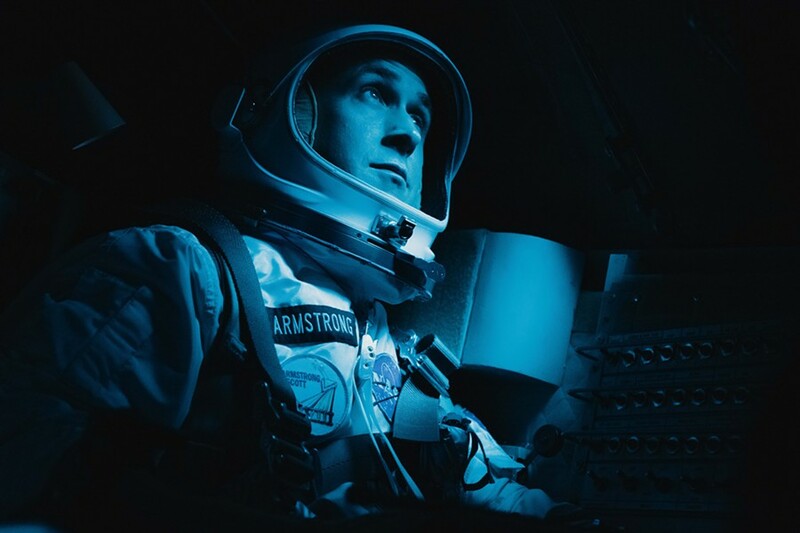 Director Chazelle — assisted by screenwriter Josh Singer, adapting the book by James R. Hansen — takes the trouble to demonstrate that Armstrong and the rest of the early-space-era astronauts had neither the technology nor the expectations that NASA personnel might take for granted now. They were true pioneers, exploring where no one had ever gone before and flying visually as much as with instruments. First Man is nothing like a modern sci-fi space movie. There’s a complete absence of monsters, obvious CGI vistas, and mutant superheroes named for animals. Nor does it take place in the silence of deep space, à la Gravity or 2001: A Space Odyssey — Armstrong and his men clank around noisily, even on the moon. And happily, there’s almost no forced-looking service-comedy-style horsing around among the flyboys, as in Tom Wolfe and Philip Kaufman’s The Right Stuff. colleagues are ordinary Americans performing extraordinary feats in the great unknown, with sudden death staring them in the face. We feel their fears and frustrations like never before in the long history of space-travel pics. First Man realistically humanizes a genre notorious for fantasy. What a welcome change of pace. way. Also on board for Chazelle’s ride are Corey Stoll and Lukas Haas as fellow moon trippers Buzz Aldrin and Mike Collins; Kyle Chandler as NASA honcho Deke Slayton; and Jason Clarke and Pablo Schreiber as astronauts Edward White and Jim Lovell. The space center ensemble atmosphere is loose but rushed. Everything onscreen revolves around Armstrong, an utterly prosaic family man thrust into history almost against his will. The flight action scenes are as true to life as any film since the wondrous 1989 documentary For All Mankind, which used original NASA footage to tell the story of the Apollo program — including Armstrong’s “One small step for a man, one giant leap for mankind” proclamation on July 21, 1969, which he evidently thought out beforehand. As in the rest of First Man, space travel in the 1960s is shown to be a rough work in progress with very little glory-seeking, not even in the public response to the crowning feat. Armstrong’s walk on the moon drew a live TV audience of 400 million, but also inspired rapper Gil Scott-Heron’s 1970 tune “Whitey on the Moon.” Chazelle features it prominently on the soundtrack over scenes of life back here on Earth: “Was all that money I made las’ year / For Whitey on the moon? / How come there ain’t no money here? / Hm, Whitey’s on the moon.” First Man, with its reluctant hero and Spam-in-a-can military-political heroics, has real-world meaning 50 years after the fact to go along with its thrilling flight sequences. Quite a feat.